The 2016 meeting of the Criminal Law Journal Editorial Board was held on 22 March at Government House, Tasmania. Thomson Reuters and the Board are both grateful to Her Excellency Professor the Honourable Kate Warner AM, Governor of Tasmania, for hosting the event. This year marks the Journal’s 40th year in publication. 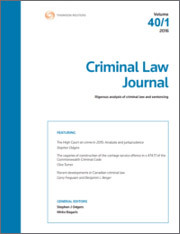 The Journal was first published in 1977 and over the years has featured in-depth articles providing rigorous and timely analysis of criminal law and sentencing in Australia. Consideration is given to law reform issues, comments on High Court and State criminal cases, relevant legislation, a digest of recent criminal cases, book reviews and reports of developments in criminal law in Australia and overseas. The meeting was chaired by the Hon Michael Kirby AC CMG, Chairman of the Editorial Board and included a report from General Editors Stephen Odgers SC and Professor Mirko Bagaric. As mentioned above, it was hosted in the iconic Government House by Her Excellency the Governor, who retired as Sentencing Editor from the Journal in 2015 but remains a member of the Journal’s Editorial Board. Other Board members in attendance included Matthew Goode, Editor of the Australian Criminal Reports; and Professor Simon Bronitt. Joining us by teleconference were Justice Mark Weinberg, of the Victorian Court of Appeal and David Grace QC. Non-board members in attendance included Associate Professor Lorana Bartels, the Journal’s Sentencing Editor; Terese Henning, Tasmanian State Editor for the Journal; and staff from Thomson Reuters, Catherine Roberts, Thu Luc, Shannon Kelly and Anthony Robjohns. With the future of the Journal such a topic of passion, much lively discussion was had regarding its development into the future. Strong practitioner feedback regarding the digest of recent criminal law cases section, and the yearly analysis of Australian High Court and sentencing law, and Canadian criminal law comparison articles, led to discussions on how to expand these topics with new subject areas and jurisdictions. The meeting was followed by an evening event at the Henry Jones Art Hotel, at which all were honoured with the presence of Her Excellency the Governor, the Hon Michael Kirby, as well as the Hon Chief Justice Blow and the Hon Justice Porter of the Tasmanian Supreme Court. Shannon Kelly is a Senior Legal Editor with The Laws of Australia encyclopaedia and the Product Editor of the Criminal Law Journal and Company and Securities Law Journal.